This is the second in a series of posts covering the recently-published report compiled by Forest2Market titled “Changes in the Residual Wood Fiber Market 2004 to 2017.” Our analysis uncovered four key findings that show both structural and temporal market shifts in recent decades have impacted the markets for wood fiber residuals. This independent report was commissioned by Resources for the Future (RFF), the US Endowment for Forestry & Communities, Inc. (Endowment) and the National Wooden Pallet & Container Association (NWPCA). Key Finding #2: Buoyant demand for softwood fiber has been driven by strong pulp markets and bioenergy in the form of pellets. Demand for softwood fiber has increased substantially over the last decade. The rise of the European wood pellet industry has resulted in 10 million additional tons of fiber demand, much of which is being supplied from the softwood resource in the US South. During the same period, demand for fluff pulp for absorbent products has spawned new southern pulp production. The recovering economy along with the migration to online retailing has increased demand for cardboard boxes that are principally fulfilled by the southern pine pulp industry. The most significant development in the forest products industry over the last decade has been the addition of industrial wood pellet mills in the US South. While pellet producers consume residual chips and pulpwood, most prefer sawdust and shavings as their primary feedstock since these fine materials require less effort to process. However, the emergence of large pellet mills in many cases has made the need for pulpwood a supply necessity. European utilities have increasingly relied on the use of industrial wood pellets as one of the most efficient means of meeting renewable energy and carbon emissions reduction targets while displacing coal as the primary source of electricity generation. Long-range goals include the use of solar, wind and other “green” technologies to generate energy, but woody biomass is reliably filling the renewables gap especially as it relates to base load capacity (ability to dispatch on demand), something that rapidly growing solar and wind generated power cannot currently do, while some of the other technologies are in the developmental stage. 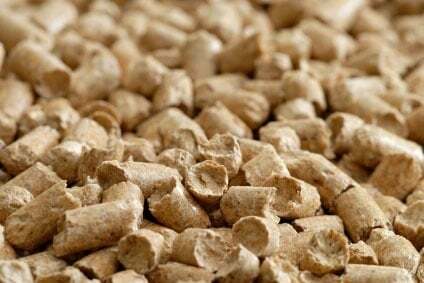 This new demand—driven by a consumer preference for more renewable energy and by EU subsidies to support a renewable transition—has facilitated the development of large-scale wood pellet export mills in the US. UK-based companies, for instance, either offer US producers secure long-term contracts, or they purchase facilities in the US, vertically integrating into the region. Without the industrial wood pellets produced in the US, large scale coal-to-biomass conversions would have been impossible. Over the last ten years, wood pellet exports from the US have increased from less than 30,000 tons in 2008 to over 5 million tons in 2017. For decades, a latent domestic pellet market has existed in the PNW and other northern regions of the US. However, this market is highly localized to areas that necessitate alternative sources of fuel for a variety of heating applications and constitutes a small percentage of the total volume of pellets that are produced in the US. In recent years, demand in this market has fluctuated wildly due to mild winters and low-cost competitors such as natural gas, electricity and fossil fuels. Additionally, unlike in the EU, no federal legislation facilitates pellet adoption. While US pellet exports have played a significant role in enabling large-scale coal-to-biomass conversions and co-firing projects in Europe, growth in the European industrial pellet market is decelerating as fewer coal units remain to be converted to wood pellets. 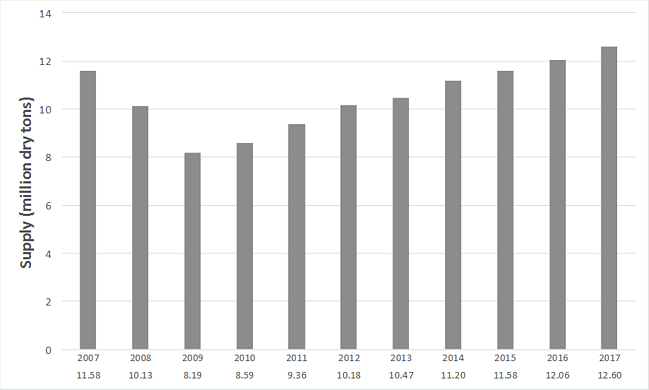 As a result, US wood pellet exports to Europe are starting to slow after growing at a rapid 63% compound annual growth rate (CAGR) from 2011 to 2014; pellet export growth has slowed to 6.4% CAGR from 2014-2017. New demand flattened in 2017 and minimal EU growth is forecast in the near term, but bourgeoning biomass and wood pellet opportunities exist throughout Asia. From 2012 to 2017, wood pellet imports to Japan and Korea increased from less than 200,000 tons to nearly 3 million tons. Expectations for future demand in Asia are between 10 - 20 million tons within the next ten years. High-quality fluff pulp is an absorbent material made from bleached softwood cellulose fiber that is used globally in a variety of applications such as feminine hygiene products, baby diapers and adult incontinence products. While this is a relatively small market at 6 million tons currently, worldwide demand is increasing at 4% annually. This is a clear example of a situation where a change in customer preference has not changed the total demand for raw wood material, but rather has shifted the demand from one product to another. In many cases, this change has driven machine conversions at existing mills (hardwood) as demand is reallocated to other products and markets (softwood). As of 2017, three facilities have already made this transition—two International Paper Company mills in Franklin, Virginia and Riegelwood, North Carolina and one Domtar Inc. mill in Ashdown, Arkansas. While the processes involved in converting a mill to manufacture a different product can be very expensive, it is far less costly than a shutdown or a new building project. Containerboard is a specific type of paperboard that is manufactured for use in the production of both linerboard (facing) and corrugating medium (fluting), the two wood fiber components that make up cardboard boxes. According to the American Forest & Paper Association, more than 95% of all products in the US are shipped in cardboard boxes, which are made from high-strength softwood fiber. This product is very well-positioned in the growing e-commerce market, as online orders arrive in high-grade cardboard boxes to prevent damage during shipping. Individual product shipments use much more containerboard per delivery than bulk shipments from the manufacturer to the retailer. This underpins the demand for containerboard and related packaging. Since most containerboard is made from softwood fiber, the e-commerce phenomenon is sustaining demand for softwood residual chips and pulpwood as manufacturers of containerboard products prefer softwood fiber because of its strength characteristics. Over the last several years, this segment has increased production by nearly 2% annually and demand for containerboard is increasing at an annual rate between 2-4%. Demand trends look favorable for the future as well; e-commerce sales are expected to increase from 10.2% of all retail sales to 17.5% in 2021. 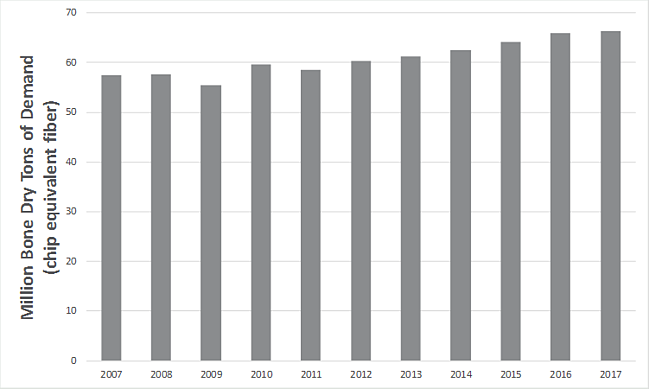 The 2008 recession had a devastating effect on sawmill production in the US South and the region’s mill portfolio has been dynamic over the last decade as a result. The permanent closure of three pulp and paper mills and three particleboard plants was met with the opening of 16 new industrial pellet facilities, which led to a 10% increase in the total number of residual wood fiber consumers. 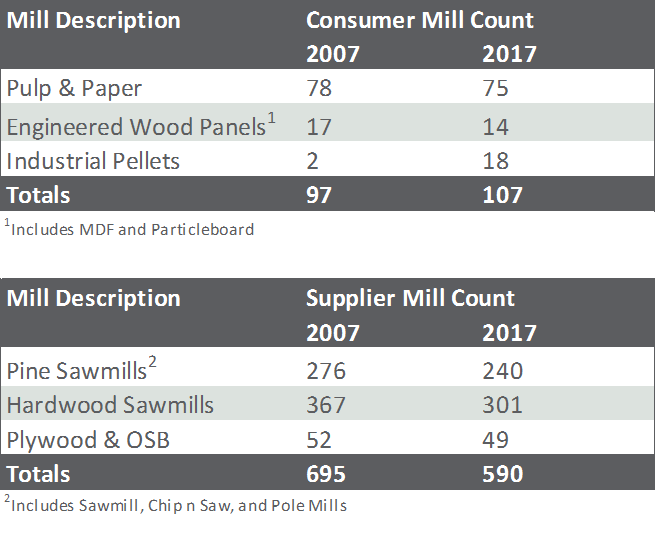 Conversely, 36 pine sawmills and 66 hardwood sawmills have closed during the same period, which led to a 15% decrease in the total number of residual wood fiber producers. The combined total number of residual wood fiber consumers and suppliers has decreased by 12% over the last decade. 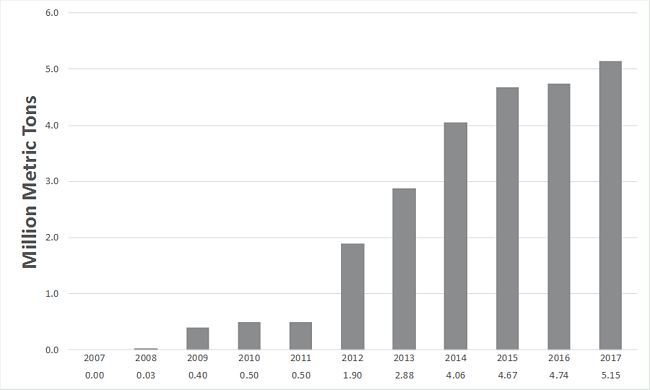 Prices for residual chips—both pine and hardwood—have increased modestly over the past 10 years, even though each has dramatically different supply and demand trends. 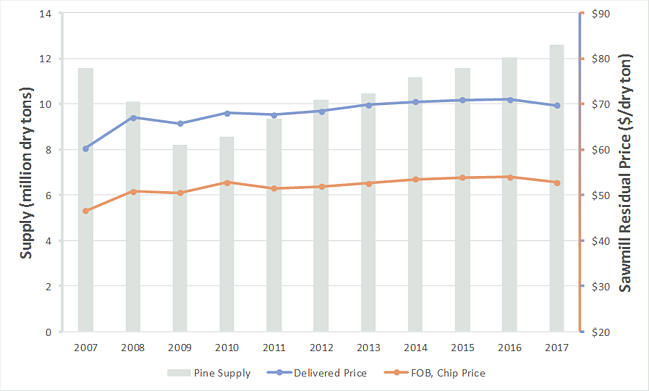 The supply and demand for hardwood residuals has trended down, while pine has followed an exact opposite trend: As pine residual chip supply has increased, both delivered and FOB chip prices also increased. The increase has been modest, however, below the rate of general inflation. The softwood residual market has been soft, but stable, for some time. However, the supply, demand and volume flows of softwood residual products surpassed 2007 levels by 2017, indicating a full recovery from—and adjustment to—the impacts of the Great Recession. With expanding southern lumber production and associated residual production, we expect the softening to continue, though we don’t expect the excess supply of chips and wood fuel to inhibit growth in the sector. The counterbalance to the new supply of chips is the growth in the softwood pulp industry (fluff pulp and containerboard), composite panels and wood pellets. The industry in the US South is solidly profitable with globally-low cost structures. Despite the potential oversupply of residual chip material, we believe that any negative result from this—if it occurs at all—will be borne by the forestland owner as mills choose to weight their pine fiber mix toward wood residuals and away from pulpwood. Ultimately, pulp mills have a lot of supply chain flexibility to substitute pine pulpwood stumpage for residual sawmill chips, which sustains the low cost structure in the region and creates opportunities for new capital inflows.